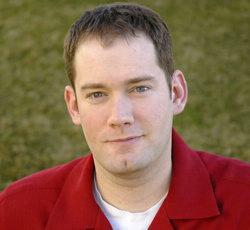 Brandon Mull no longer lives on the side of a mountain above a prison. He now resides in a happy little valley near the mouth of a canyon with his wife and children. Find out more at Brandon Mull’s website. Click here for more stories by Brandon Mull. 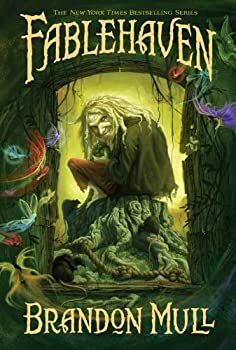 Fablehaven — (2006- ) Ages 9-12. Publisher: For centuries mystical creatures of all description were gathered into a hidden refuge called Fablehaven to prevent their extinction. The sanctuary survives today as one of the last strongholds of true magic. Enchanting? Absolutely. Exciting? You bet. Safe? Well, actually, quite the opposite. Kendra and her brother, Seth, have no idea that their grandfather is the current caretaker of Fablehaven. Inside the gated woods, ancient laws keep relative order among greedy trolls, mischievous satyrs, plotting witches, spiteful imps, and jealous fairies. However, when the rules get broken — Seth is a bit too curious and reckless for his own good — powerful forces of evil are unleashed, and Kendra and her brother face the greatest challenge of their lives. To save their family, Fablehaven, and perhaps even the world, Kendra and Seth must find the courage to do what they fear most. CLICK HERE FOR MORE FABLEHAVEN / DRAGONWATCH STORIES. Kendra and Seth have to spend 17 days with their grandparents who they barely know while their parents go on a trip. Dropped off at the huge isolated estate deep in the forest, the kids have no idea what to expect. Little did they think they would discover that their grandparents are the caretakers of a nature preserve for magical creatures of all sizes, shapes and inclinations. But now it seems that Grandma has mysteriously gone missing, and that is just the beginning of the problems the children will have to face. 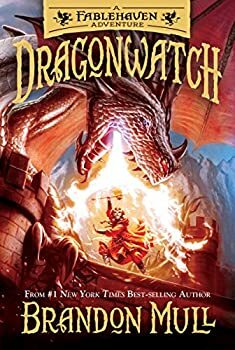 Fans of Brandon Mull’s FABLEHAVEN middle grade fantasy series now have a chance to revisit that world with Dragonwatch (2017), the first book in his new FABLEHAVEN ADVENTURE series. In the world of FABLEHAVEN, mythical beings like fairies, centaurs, dragons and demons actually exist, living in hidden, protected sanctuaries where most humans are unaware of their existence. Even if you enter a preserve, unless you drink the milk of a magical milch cow, fairies look like dragonflies or butterflies, nipsies seem to be mice, satyrs appear as goats, and so on. Beyonders — (2011-2013) Ages 9-12. Publisher: Jason Walker has often wished his life could be a bit less predictable — until a routine day at the zoo ends with Jason suddenly transporting from the hippo tank to a place unlike anything he’s ever seen. In the past, the people of Lyrian welcomed visitors from the Beyond, but attitudes have changed since the wizard emperor Maldor rose to power. The brave resistors who opposed the emperor have been bought off or broken, leaving a realm where fear and suspicion prevail. In his search for a way home, Jason meets Rachel, who was also mysteriously drawn to Lyrian from our world. 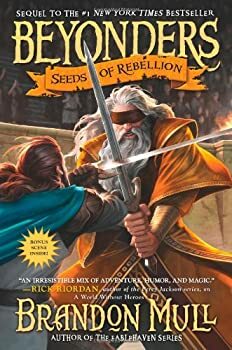 With the help of a few scattered rebels, Jason and Rachel become entangled in a quest to piece together the word of power that can destroy the emperor, and learn that their best hope to find a way home will be to save this world without heroes. Jason Walker, an eighth grader, was having a fairly normal day — playing baseball with his friends and working at the zoo — until he heard music coming from the hippopotamus tank. When he leaned over the rail to listen more closely, he fell in and was swallowed by the hippo. Instead of ending up in the hippo’s digestive tract, though, he ended up in a parallel universe named Lyrian. Rachel Woodford, a smart home-schooled girl around Jason’s age, was on vacation with her parents in Bryce Canyon when she followed a strange butterfly through a stone arch and ended up in Lyrian, too. 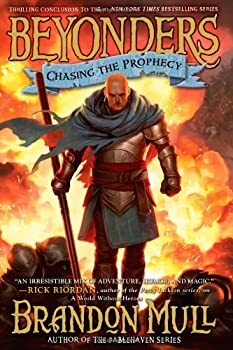 Chasing the Prophecy is the final book in Brandon Mull’s BEYONDERS series aimed at a middle grade audience. Jason and Rachel have joined a group of rebels who hope to take down the evil emperor Maldor. An oracle has told them that they have very little chance for success, but she’s also told them exactly what they need to do to have that small chance. Therefore the group has split up into separate teams which hope to fulfill different parts of the oracle’s instructions. Rachel is trying to muster up an army while working on her magic and Jason’s team visits a library (I loved the library!) to try to find the location of an ancient seer who has information they need. Both kids face hard work, difficult decisions, and life-threatening circumstances. Each must be willing to bend a lot to accomplish their goals. Five Kingdoms — (2014-2016) Ages 8-12. 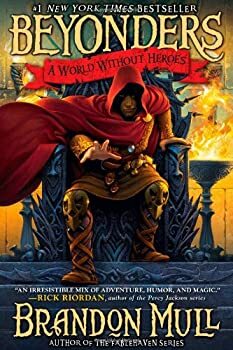 Adventure awaits in the Five Kingdoms—come and claim it in this start to a new series from the #1 New York Times bestselling author of the Fablehaven and Beyonders series. Cole Randolph was just trying to have a fun time with his friends on Halloween (and maybe get to know Jenna Hunt a little better). But when a spooky haunted house turns out to be a portal to something much creepier, Cole finds himself on an adventure on a whole different level. After Cole sees his friends whisked away to some mysterious place underneath the haunted house, he dives in after them — and ends up in The Outskirts. The Outskirts are made up of five kingdoms that lie between wakefulness and dreaming, reality and imagination, life and death. It’s an in-between place. Some people are born there. Some find their way there from our world, or from other worlds. And once you come to the Outskirts, it’s very hard to leave. With the magic of the Outskirts starting to unravel, it’s up to Cole and an unusual girl named Mira to rescue his friends, set things right in the Outskirts, and hopefully find his way back home… before his existence is forgotten. 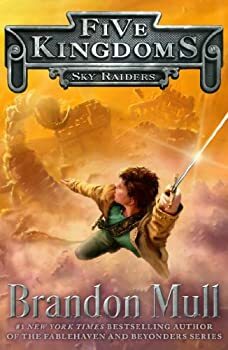 Sky Raiders is the first book in Brandon Mull’s new FIVE KINGDOMS series for Middle Grade readers. It’s about a boy named Cole who takes his friends, including a girl he has a crush on, to a haunted house on Halloween Night. The occupants of the house lure the kids into the basement where they’re abducted, taken to another world called The Five Kingdoms, and sold into slavery. As you might guess, Cole feels a little guilty about this. He’s determined to escape and free his friends. He outwits enemies and battles giant snakes, scorpions, and even a cyclops. Then he finds an ally in a girl named Mira, a girl from the Five Kindgoms who is also a slave. Can Cole and Mira free Cole’s friends? Can Cole get back to Earth? Well, he does make some progress toward that end in Sky Raiders, but there’s plenty more to accomplish in the next volume of THE FIVE KINGDOMS. 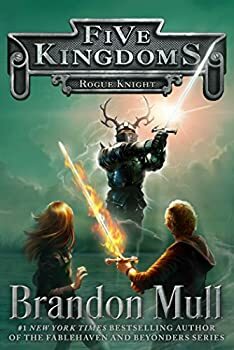 Rogue Knight , book two of Brandon Mull’s FIVE KINGDOMS series, continues the story about Cole, the boy who took his friends to a haunted house on Halloween and unwittingly caused them all to be sold into slavery in another universe. (Ouch.) Cole managed to escape slavery, but he’s racked with guilt, and now, with the help of some friends he’s made in The Outskirts, which consists of the five kingdoms of this series’ title, he hopes to eventually save his friends.